Could single grain Scotch become as popular as single malt? Now that William Grant is joined by Diageo (and David Beckham) in the race to establish the category, it could happen sooner than you think. William Grant claims its launch of single grain whisky Girvan is an “ambitious challenge” to champion the emergence of a “third leg of the Scotch whisky category”. The family-owned, UK-based company is certainly known for its innovation over the years, having pioneered the global advent of single malt with Glenfiddich back in 1963, but how much commercial viability is there in single grain Scotch, and will Girvan really grow, as anticipated, to become a one million case brand in 60 years? The group launched two expressions of Girvan in March: a 30-year-old and a no-age-statement whisky, Girvan Patent Still #5974, that both premiered alongside its existing 25-year-old at Whisky Live in London on 21 March. 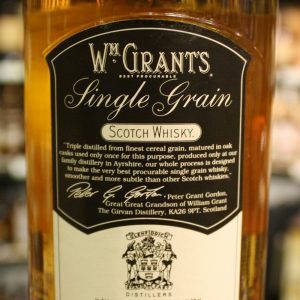 But while Girvan looks set to become a prominent advocate of single grain Scotch, it certainly isn’t launching the category. Grain whisky has been produced in Scotland since the 15th century, using cereals not required as food. Since the invention of the continuous column still in the late 1820s, distillers have been using grain whisky to balance out what was typically very heavy malt whisky in blends.